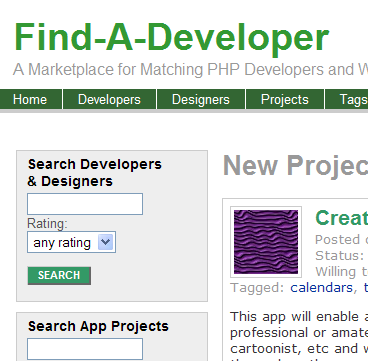 I have written a web app called Find-A-Developer for matching developers to people with good ideas for Ning projects. But the beauty of this is that you can clone this web app for your own project. Start by clicking Clone This App (email me if you need a hand). For example, I have created a clone called Find-An-OpenJUMP-Developer for matching open-source developers with people who need an OpenJUMP plugin or customization. (OpenJUMP is an open-source GIS that I've been involved with for a couple of years). posted by Jonathan at 11/22/2005 07:09:00 p.m.